← The Week Ahead…and a Look Back at Last Week’s ANC Meetings in Photos. Kingman Park Historic District came into being June 24. ANC6B has put CM Charles Allen, Mayor Bowser, and the Historic Preservation Board on notice that it believes that the process for designating new historic districts “is not working to serve District residents” and wants the city to review it before any more historic districts are approved. In addition, the ANC specifically wants clarification of both the ANC’s role and the role of community support or lack thereof in the process. The charge, detailed in a letter authored by 6B’s Planning and Zoning Committee Chair Nick Burger and passed by 5 – 1 vote of the commission, was sparked by the Historic Preservation Board’s (HPRB) recent designation of the Kingman Park Historic District, apparently over the opposition of a majority of the residents, as well as a recent series of inconsistencies in HPRB actions in ANC6B’s jurisdiction. A case in point regarding the latter was HPRB’s failure to refer a historic preservation application to the ANC after the historic preservations staff made substantive changes to the application and referred it directly to the HPRB for approval. In addition, the letter cited deficiencies in HPRB’s notification process and ambiguity regarding criteria for adjudicating historic preservations cases. Regarding the Kingman Park Historic District, City Paper recently reported (https://bit.ly/2Lgwt1p) the DC’s Historic Preservation Office opinion on the changing national climate about what constitutes eligibility for historic designation – broadening the definition of beyond those neighborhoods with unique and historic architecture, to include consideration of the value and meaning that the diversity of minority communities bring to the city. In accordance with a change in thinking, a long-standing civic group (the Kingman Park Civic Association) filed an application for the Historic District directly with the Office of Historic Preservation (HPRB’s administrative arm), by passing the local ANC, the usual route to historic district designation. The move was controversial; in general (according to press reports) older residents of the historic black community preferred historic designation while newer residents were wary of the accompanying restrictions which would prevent them from expanding homes to accommodate growing families. As the controversy played out – apparently without substantial outreach and notification to the community – HPRB appeared to put the onus for community engagement on the ANC7D – home to most of the proposed historic district – rather than on the sponsoring civic association which is customary. The Friends of Kingman Park civic association, formed to oppose the historic designation, conducted a survey and claimed that 72 % of respondents in Kingman Park opposed a historic district. 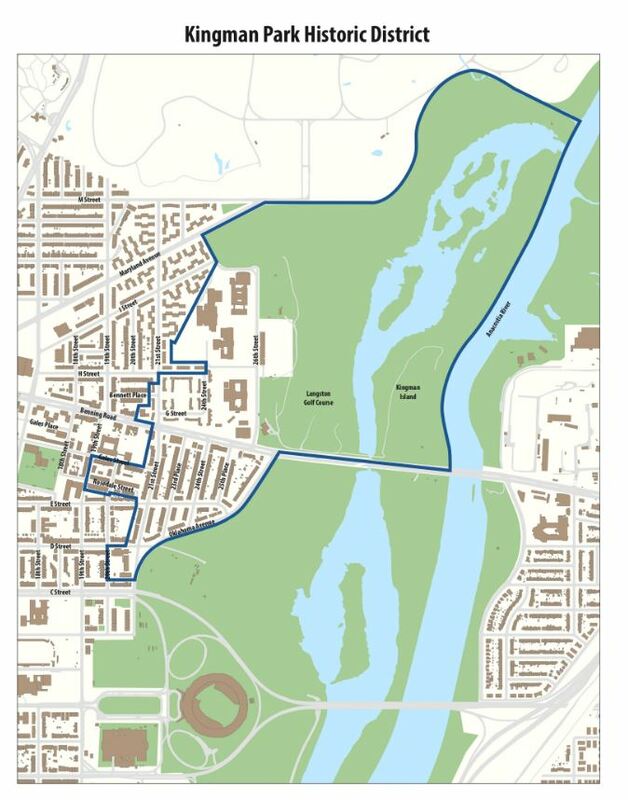 Despite the lack of evidence of the support of a majority of residents, HPRB approved the application and Kingman Park Historic District came into being on June 24, though smaller than what the applicants had wanted. It is noteworthy that HPRB is not required to take community opinion into consideration. According to ANC7B Commissioner Bob Coomber, “We (ANC7B) heard the applicants twice, but the applicants mostly made ad hominem attacks against me and the Chair, so we didn’t have enough information to vote either time.” ANC6A, on the other hand, claiming status since two blocks of proposed historic district was in their jurisdiction, voted to oppose the Kingman Park Historic District based on limited communication and outreach and lack of transparency in the process. Beth Purcell, who is active in historic preservation on Capitol Hill, when asked to comment on the ANC6B’s letter, says that when people come to the Capitol Hill Restoration Society seeking information on establishing a historic district, she urges them to consult their ANC commissioner immediately and get the ANC to sponsor it. She suggested the letter could have been improved by making a case for adding conservation districts as “another tool in the tool box.” Purcell said she is not aware of any current plans for expansion of the Capitol Hill Historic District in ANC6B. An attempt to establish the Barney Circle Historic District in Hill East in 2010-2011 foundered, after it failed to get the endorsement of ANC6B. Capitol Hill Corner asked ANC6B chair Dan Ridge, who voted for the letter, to comment. Ridge said that “the Capitol Hill Historic District is a failure at a number of things,” noting it has done nothing to restore the street car routes that made neighborhoods practical for downtown workers and nothing to support the small merchants that make a historic neighborhood work. He says it has also failed by using the force of law to preserve architectural features that enable passive cooling and heating while doing nothing to incentivize using those features, and nothing to prevent people from filling open courts in the rear that bring in fresh air and daylight to interior rooms. For the full text of ANC6B’s letter, visit the “Library” on Capitol Hill Corner’s homepage. As a resident of Kingman Park I would like to provide a couple of corrections and context. First, the KPCA was officially sanctioned and is no longer recognized as a representative civic association, due to several instances of bad behavior. The FOKP was not formed to fight the historic designation, but instead to continue a tradition of welcoming neighborhood engagement which the KPCA had abandoned. Additionally, the characterization of long-term residents supporting designation and short-term residents opposing fits a stereotype and bias but was not borne out in fact. Indeed, often it was the other way around. Many of the most passionately opposed citizens are long-term residents who had no desire for a new government-imposed burden. Instead, the greatest support in favor of designation came from outside the neighborhood, from former residents who had left but wanted restrictions placed on the people who remained in the area. I question any ANC commissioner in 6B being contrary to historic districts. Isn’t that supposed to be a misnomer? I am disappointed in the ANC6B (but not surprised that Nick Burger wrote the letter as, from what I have seen, he is more supportive of developers than residents). The ANC should be focused on getting the HPRB to function properly, not on preventing new historic districts. Developments like Hine make me feel like I no longer live in the historic district I moved into. Hill Girl, Are you being serious in your post? I have lived on the Hill for fifteen years and the essential attributes that make it Hill-like to me are still very much in place. The Hill has always been changing and developing so change is just baked into the cake for me. There is room to criticize the Hine development but the heart of the argument is the absolutely appalling design that the CHRS, the ANC, and the HPRB allowed to go into the heart of our community. I mean, have you LOOKED at that monstrosity? The asymmetrical corbeling, the weird building on 7th and PA (what’s up with those narrow windows? ), the lifeless streetscape. I could go on. Who approved it? And what were they thinking? The Hine project was the perfect opportunity for the CHRS to take a strong leadership role in advocating for an elegant and gracious addition to the neighborhood. Instead we got a blight that may please a tiny handful of architecture critics but leaves the vast vast majority of the community deeply unhappy and de-activates a chunk of the “town square” of Capitol Hill. The CHRS is rightly perceived as a militant minority. This was their chance to significantly improve their image by advocating for positive change –but they blew it. What a loss for them and, more importantly, for us. I live around the corner from the Hine project and love it. The Hill needs to evolve. Agree with ANC6B on all points. CHRS has too much influence in zoning and permitting. What you have in the CHRS and the HPO is a small cabal of people who have the power to seriously impact a person’s property rights without due process or any chance of appeal. The CHRS is a group of like-minded folks who, for some reason, have an unmatched influence on the HPO. The HPO consists of an unelected board of preservationists who will essentially rubber stamp any historic preservation application that passes by the committee. So, is anyone really surprised when the overwhelming majority of impacted people’s opinions are ignored in favor of those who neither live in the proposed area nor will be forced to bear the burden of the outcome? I understand why the HPO can’t put it to a simple majority vote of residents, but when they ignore deep and wide resistance and ram an unwanted historic designation on those who don’t want it you’re certainly left to feel as though democracy and the rule of law are broken. Finally. Please take the next step and aboliosh the existing historic districts. CHRS is an unelected bureaucracy that should have no say over private property.